I first saw the announcement for this model kit on CollectSpace.com. The kit was still weeks from release, but a number of sellers, many on eBay, were already taking advance orders. 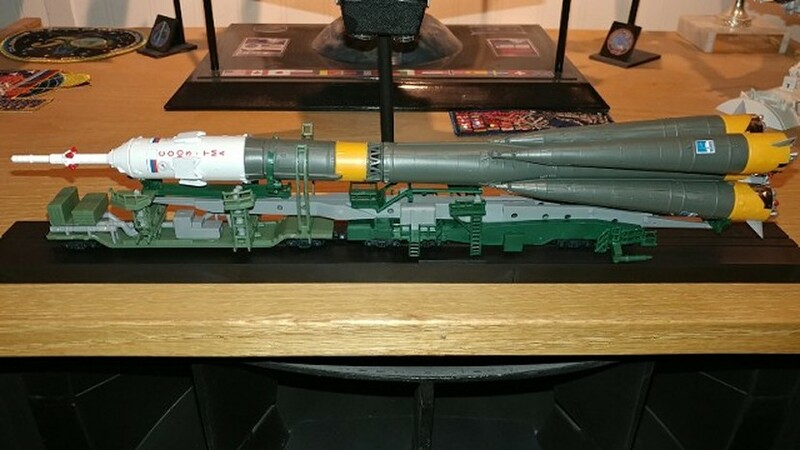 I decided to give it a go, as this would likely be as close to a "launch complex" model for the Soyuz as I would get. 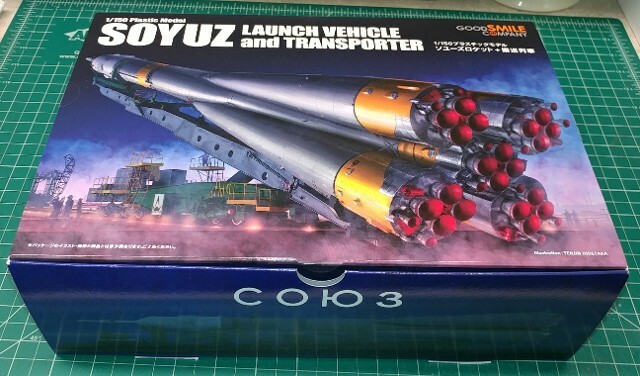 While LVM Studios does produce very precise photo-etched metal models of the Soyuz Launch Complex in 1/144 scale, the cost is fairly high. 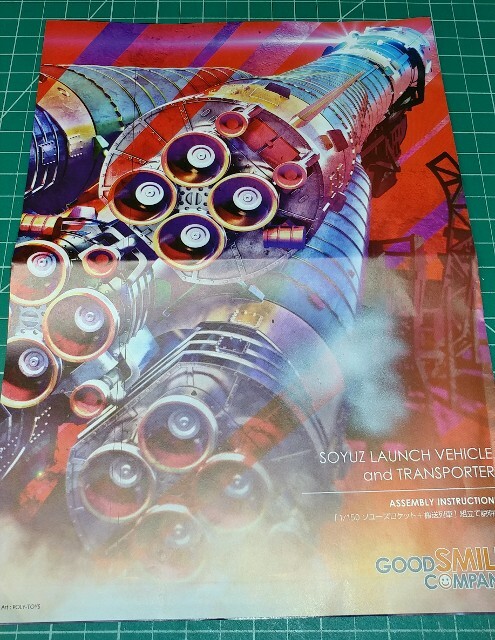 And, while I had not previously heard of the "Good Smile Company" of Japan, the CollectSpace article did have good words to say about their reputation and quality, referring to them as a "less-expensive version of Bandai-type models." It took over three months after the pre-order to finally get the model, but it finally arrived and in perfect condition. The box art was lavish and even the construction of the container looked of something well-made. The bottom of the carton showed images of the completed prototype model. Even the instruction manual had nice artwork on its cover page. 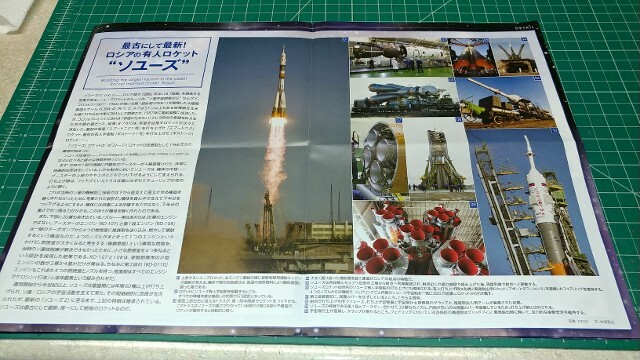 The front pages of the manual provides an overview of Soyuz Booster ground operations and launch procedures, but 95% of the manual in in Japanese, only! 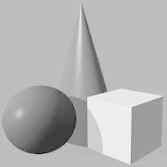 There are, however, good drawings in each step, so we never had too much trouble figuring out what to do. I did not take pictures during the construction process, as this was not intended to be a point-by-point build article. Good Smile sells this model as a "snap-fit" model, and there are some sections and assemblies you will want to leave that way, so you can later open things up or separate them. However, there are more than a few locations that benefited from a drop or two of liquid plastic cement, to maintain alignments or seal up body seams. 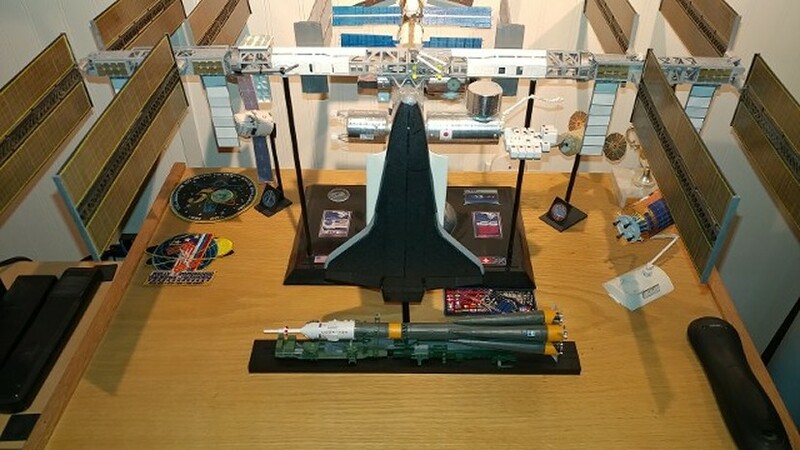 Here is the completed model, with the full spacecraft support car and booster transport car in tow. 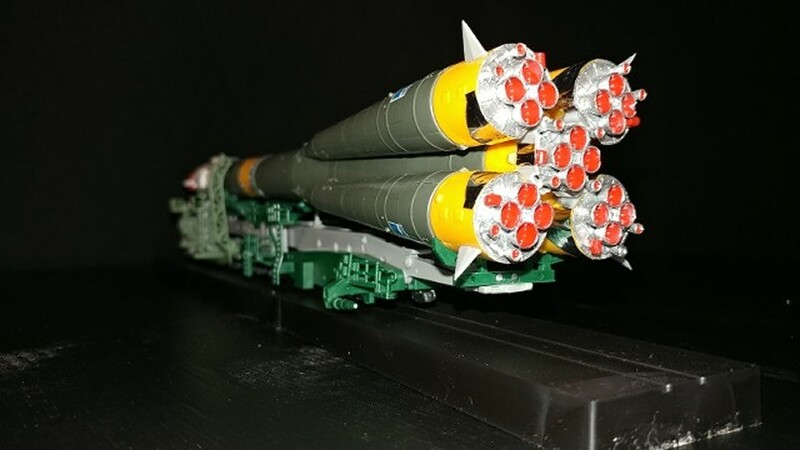 The model is molded in five colors, so there is also not much painting to do, but the booster engine nozzles, and the nozzles of the launch escape rocket do. The chrome-silver areas around the inside-bottom of each strap-on booster is a chrome plastic sticker, furnished in the kit, as are the Soyuz Spacecraft solar panels. The markings seen on the spacecraft shroud are water-slide decals. 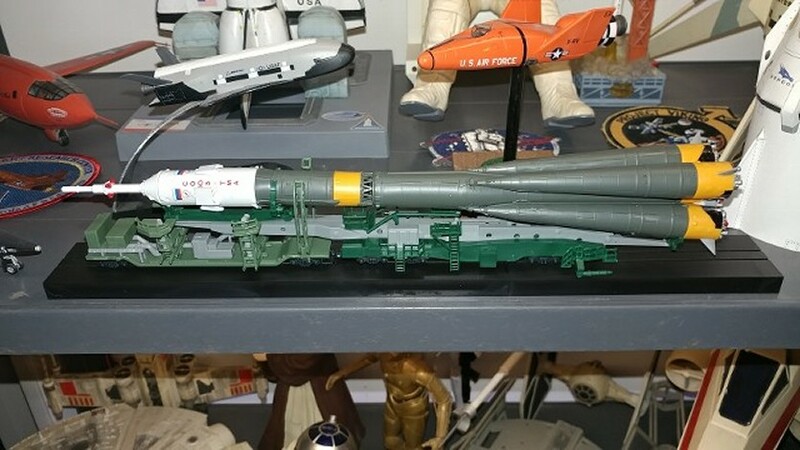 The finished model looked fundamentally excellent, but it really felt like something was missing from photos I had seen of Soyuz Rockets being rolled out. Those large rectangular emblems on the side of each strap-on booster! After a bit of graphics research, and some editing and printing, I was able to make decals using that same artwork as is on the boosters. 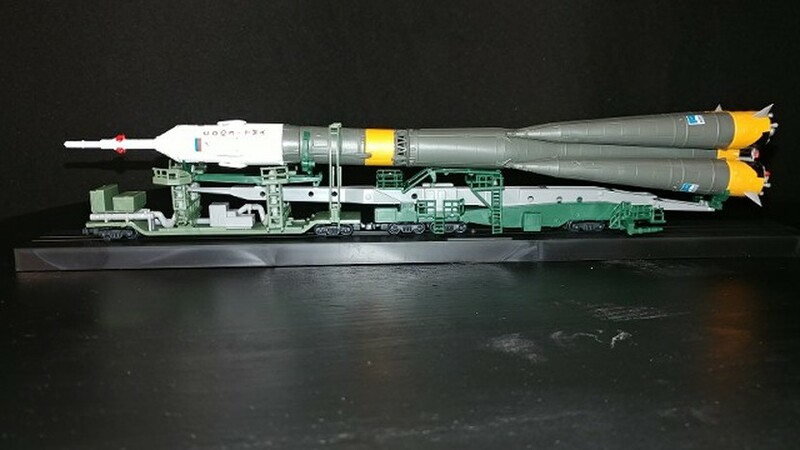 The Soyuz Launcher & Transporter are placed next to the 1/144 scale Revell ISS Model, as the Soyuz TMA is now the primary mode of transit to and from the ISS, until the new U.S. Commercial Crew vehicles begin operations. The Soyuz at 1/150 scale is at least "close" to the ISS model's 1/144 scale. 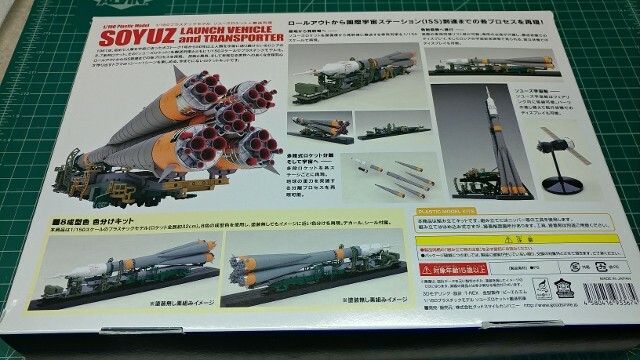 The detail provided on the Soyuz Booster and spacecraft them selves is quite good. 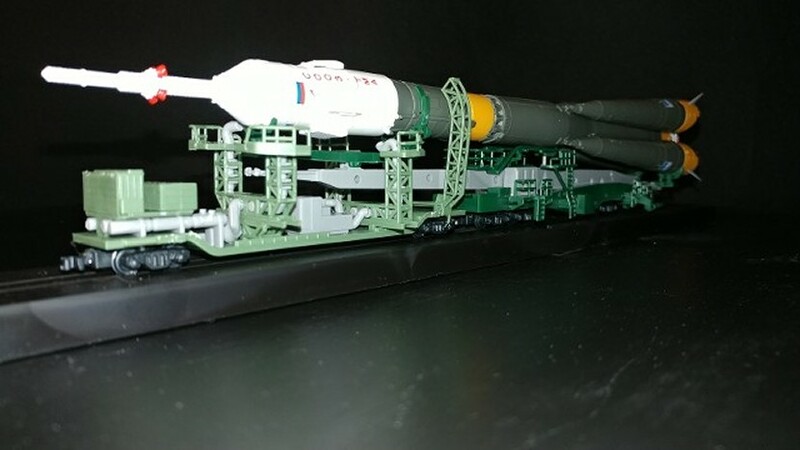 The Transporter portion of the model does fairly accurately represent the system of modified rail cars Roscosmos uses to move the rocket out of the integration building and out to the launch pad. These models are now selling for about $70 US on eBay, without the "pre-order" waiting period.